Are you off to the Canary Islands soon? 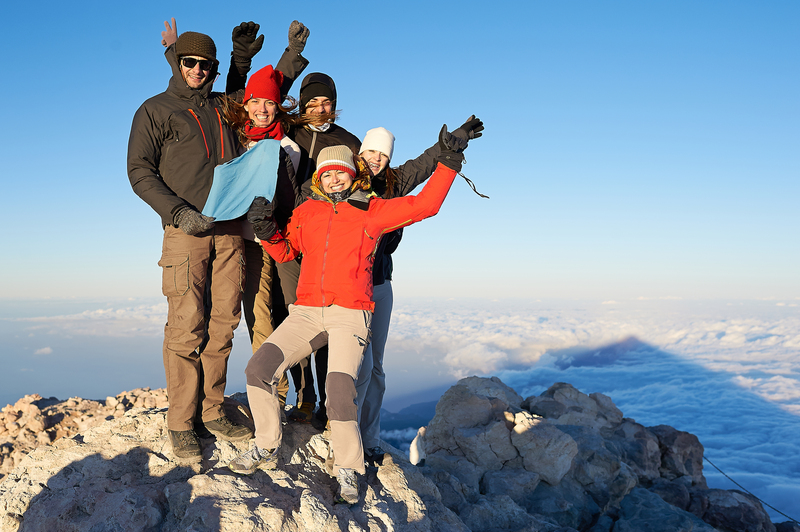 Have you written the words reach Mount Teide’s summit in capital letters on your must-do list? In this post, we’re going to take a close look at your two options for taking the cable car up Mount Teide. Cable car base station, at an altitude of 2,356 metres. Cable car upper station, at 3,555 metres, also known as La Rambleta. Teide Peak, at 3,718 metres. The trails branching from La Rambleta. Montaña Blanca, at 2,348 metres. The Altavista Refuge, at 3,260 metres. Now, let’s get stuck in. You’ll climb almost 1,200 metres between the base station and La Rambleta in a record time of just 8 minutes, whilst looking down on a geological treasure trove. Because exploring Mount Teide by cable car is an activity you can do in half a day, spending the other half relaxing at your hotel or on the beach. 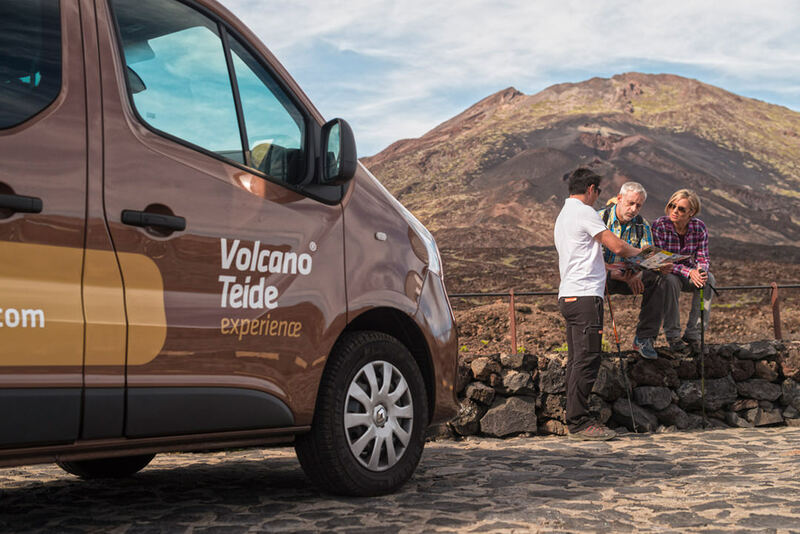 Because you want to explore the volcano on your own terms and if you get the ticket for the Teide cable car as part with one of our guided tours, a Teide National Park official guide will accompany you and tell you all about the Teide’s incredible natural and cultural heritage. Because you’ve left it too late to sort out the permit to access the peak on your own, and our Ascent to the Peak by cable car for the Mount Teide summit tour includes both the cable car to La Rambleta and the permit. Because you don’t want to do the hike up the Montaña Blanca trail, which involves a huge physical effort and spending the night at the Altavista Refuge. But, if you like a challenge, go for this option! Because you’re going with family or friends who aren’t very physically capable and would prefer to take the Mount Teide cable car. Because you’re fed up of just hearing everyone else’s stories and it’s time to reach the summit of Spain’s highest peak for yourself. Sound good? Right, then let’s have a look at your two options. Now, pay attention, as there are a series of factors that could really derail your trip to the island if you’re not aware of them. To walk the Telesforo Bravo trail that links La Rambleta with the Teide’s summit on your own, you’ll need to get your hands on one of the 200 permits that the Teide National Park management issues every day. They normally get booked up weeks in advance, so we recommend you plan ahead and sort this out as soon as possible. You can apply for your permit here, although if you want to know more about the topic then don’t miss this post in which we talk about the different ways of getting a Teide permit and how far in advance we recommend you do so. Supposing that you’ve already got the permit, something that, as we’ve said, isn’t an easy task, it’s now time to get your hands on the return ticket for the Mount Teide cable car. All you have to do is click the button below. Make sure you sort this out in advance and check that the time is compatible with the time on your permit. Get it all set in stone now! If you’re going to go take the cable car up Mount Teide on your own, there are a few things you should be aware of. For example, you should know that there’s a car park at the base station where you can leave your car, that the cable car’s opening hours are limited, and that taking the Mount Teide cable car does not mean that you automatically have a permit for reaching Teide’s summit. That, as we’ve said, is something you need to sort out before you plan anything. Preparing to reach Teide’s summit by cable car on your own is a bit of a challenge, but it can be done if you’re extremely well organised. If not, let’s take a look at the second option. If you choose this option for taking the cable car up Mount Teide, you don’t need to worry about getting the National Park permit or the cable car ticket, as we take care of all that. 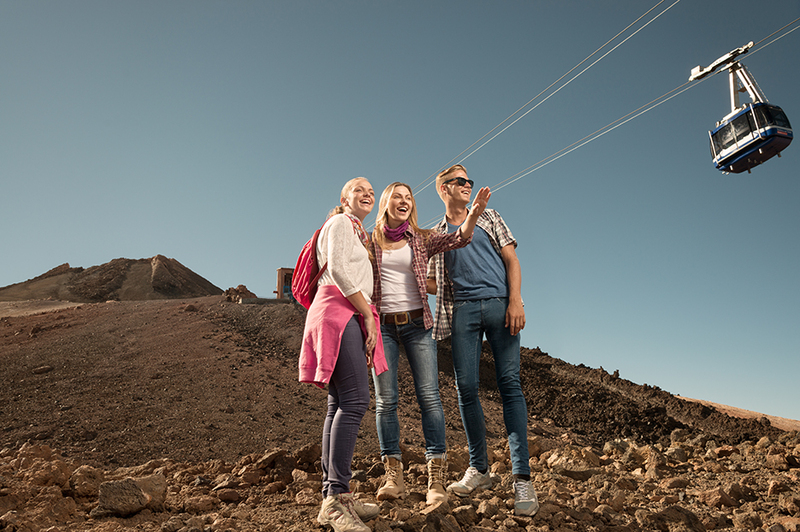 Doing the Mount Teide summit tour including cable car with us means you can take the cable car up Mount Teide to La Rambleta and enjoy the Telesforo Bravo trail, which takes you to the main crater of Spain’s highest volcano after a dreamy walk in the company of a guide. And, you don’t have to worry about getting yourself a permit, or about working out the timings of your cable car ticket to make sure the two coincide. That’s right, as we work with official guides accredited by the National Park, they give us a portion of those 200 daily permits, so rather than 2-3 months in advance you can book 7 days ahead. That’s how far in advance we recommend you book to reach Mount Teide’s summit by cable car with us, although you can actually apply up to 2 days ahead. An official Teide National Park guide who will be with you throughout. 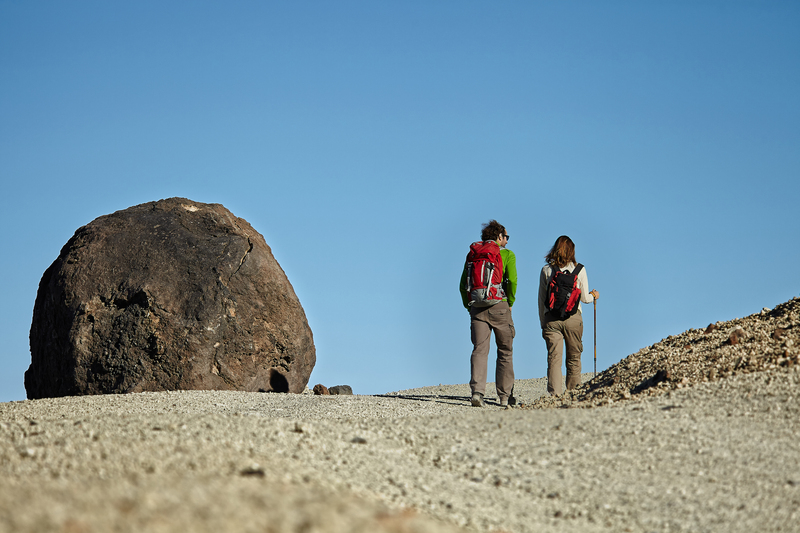 They’ll be your fountain of knowledge, history and interesting facts during your Teide adventure. Ease: The experience of the Mount Teide summit tour includes optional return transport from your hotel so that you can squeeze in a fantastic afternoon on the beach or by the pool. 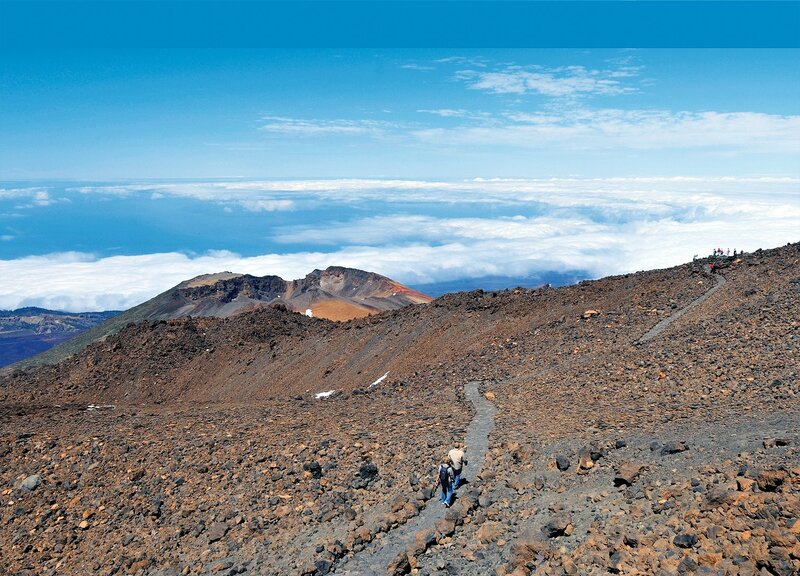 Freedom: If you prefer to find your own way there, you’re going to be able to explore the rest of the volcano in your own time when your Mount Teide summit tour including cable car ends at the cable car’s base station. You can check out all the volcano’s trails here so that you can plan the rest of your day and really get to know the park. Worry-free: The whole permit thing tends to be a bit of a headache for travellers, as as well as having to apply for it themselves they have to get a ticket for the Teide cable car at a time that works with the one on their permit. Our option of doing the Mount Teide summit tour with cable car included means all of these problems go up in a puff of smoke and everything goes swimmingly. 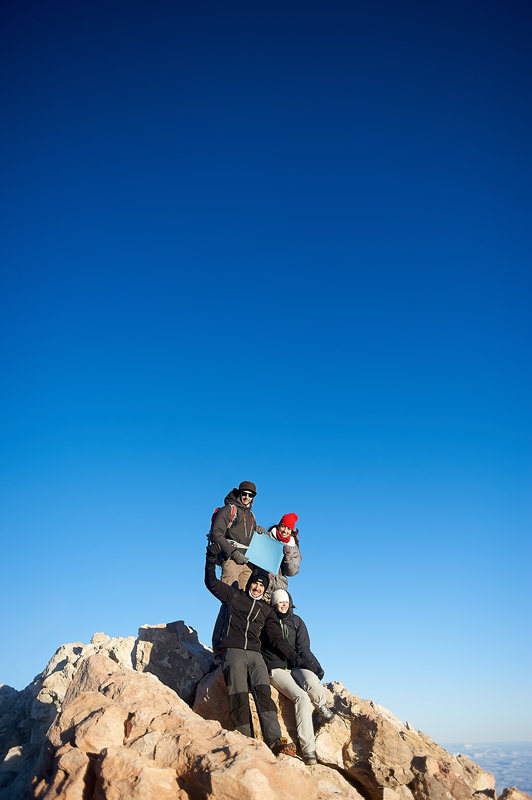 Concentrate on enjoying Spain’s highest peak, no distractions! EXTRA VIP Ascent to the Peak: This is the same tour taking you to the Pico del Teide by cable car, but is just for you. That is, your group will have its very own guide. The only thing to be aware of is that this does have to be for a minimum of 2 people. + Is the guide with me for the whole experience? - Yes, from the very beginning. If you decide to take the included transport to your hotel, they’ll pick you up and drop you off. If not, they’ll be right on time and waiting for you at the meeting point at 9.15am. + Where’s the meeting point? - If you decide to include transport in the experience, it will be at your hotel or somewhere very close by. We’ll let you know the day before by SMS or e-mail. If you decide to go under your own steam, the meeting point will be the entrance of the ‘La Casa de Los Balcones’ shop at the cable car’s base station. It’s on the TF-21 road, kilometre 43, just 90 minutes from the coast. You can get there by car or bus. + And when we’re at the upper station after taking the cable car up Mount Teide, can I walk to the peak by myself? - No: you must stick with our guide, who will also tell you things you won’t read anywhere else. + What is there at the cable car base station? - 220 spot car park, rest area, Wi-Fi, café, buffet-restaurant with views of the National Park, shop and toilets. + What is there at La Rambleta? - Wi-Fi and toilets. There’s no café, but there are drink and food vending machines. 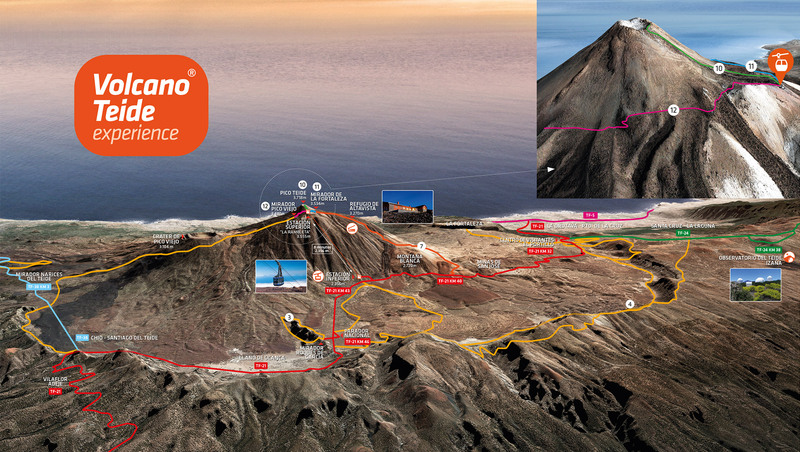 + How should I prepare to take the cable car to Teide and then walk to the summit? - You’ll need warm clothes and shoes or boots suitable for stony paths. Sunglasses are also recommended, as is water. And don’t leave your camera behind, as the views from Teide’s summit are something you’ll want to remember for a long time to come. Important: you’ll need your ID or passport, as will your companions. Although we’ll sort out the permits, they’ll be in your names. They are all named, and at the entrance to the trail that leads to Teide’s summit they will ask for ID. + How far in advance should I book the Ascent to the Peak with Cable Car activity? We recommend you book the activity a minimum of 7 days in advance, as other travellers will be booking too if they’re unable to get permits. + What time does this Mount Teide summit tour including cable car start? - If we’re picking you up, we’ll do so in the southern area between 6.30am and 7.45am. If you’re in the north, it will be between 6.45am and 7.50am. We’ll let you know in advance. If you come under your own steam, you’ll meet the guide at the meeting point at 9.15am. The activity lasts about 3 hours if you take the option that doesn’t include transport. + If I decide not to include transport and make my way there myself, what are the opening hours of the base station’s car park? - From 8am to 6pm. In July, August and September from 8am to 8pm, and in October (until the clocks change), until 7pm. + If I reserve the Mount Teide summit tour by cable car, what happens if the trail or cable car close due to technical problems or weather conditions? - We’ll offer you an alternative route. + When I buy the experience, will I have to wait for a confirmation? - Yes: As the permits are managed by the National Park, you’ll have to wait for us to confirm your chosen date. If it’s not possible then we will offer you an alternative date or give you a full refund. Mount Teide’s got more to offer than what you’ve seen in this post. For example, you can summit the volcano on foot, or you can also go to other viewpoints from the upper station that don’t require a park permit. Find out everything you need to know about Mount Teide in this other post. 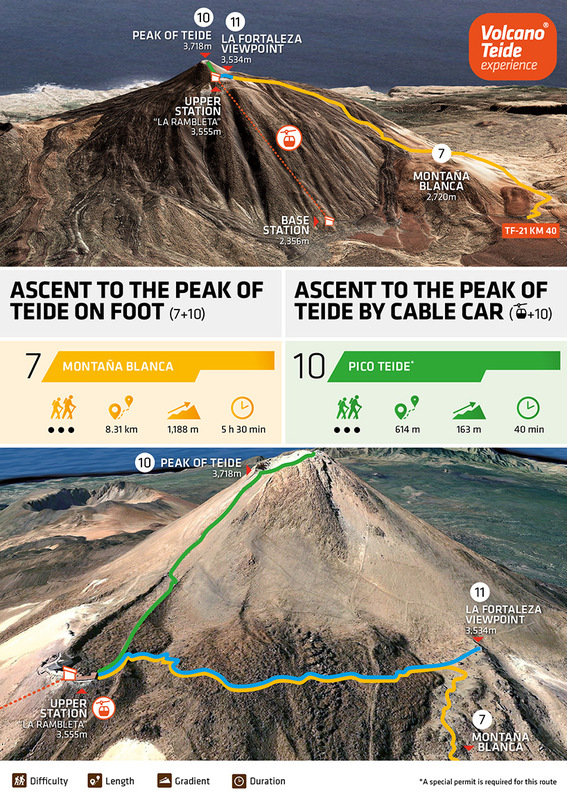 To finish off, we’ll leave you with an infographic that compares taking the cable car up Mount Teide to reach the summit with climbing the mountain on foot and spending the night at the Altavista Refuge. Calling all adventurers in search of a challenge - put yourself to the test here!